As we exchanged tasting notes, it seemed Neil and I were on the same page with the wine. I identified aromas of black cherry and raspberry, while Neil found cherry and cassis. Cherry flavors stood out for me and Neil tasted cherry and raspberry. We both found the wine to be slightly sweet, tangy, light bodied, and a long finish. It was pretty funny when we both found the same flavors in the cheese too. Maybe this wine and cheese were both pretty obvious? Or we were really on our game on Friday. The Italian truffle cheese was so savory, we couldn’t get over it. Neil said we were in trouble because we were going to eat the entire wedge of cheese. I did find the cheese to have an initial funkiness to it but then it was so savory! We agreed that it had a medium texture and must have been cow’s milk for the creaminess. I found the flavor to be very similar to “breadstick seasoning” and Neil said that there was an amazing truffle flavor oozing out. Whatever you want to call it, it was Delicious! 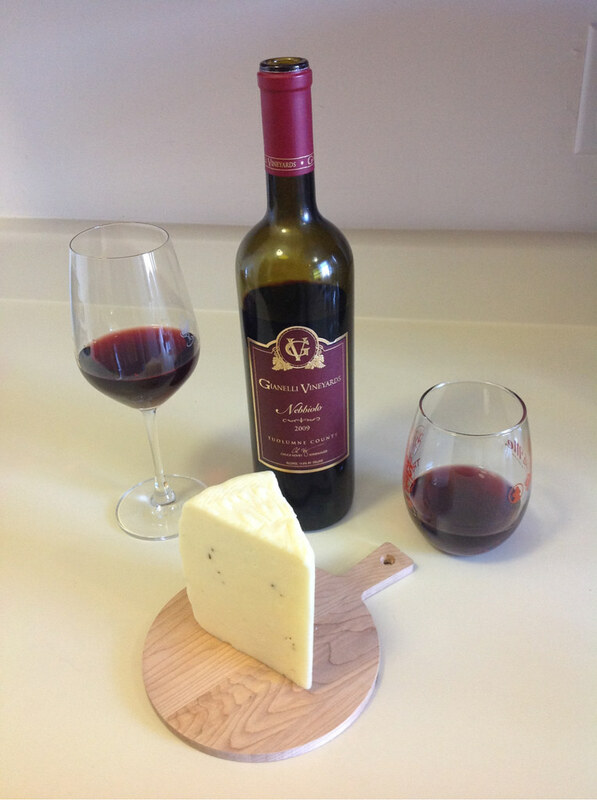 During the pairing of Nebbiolo and Italian truffle cheese, Neil noticed the sweetness of the wine to be elevated to a Jolly Rancher candy with more berry flavor and found the cheese to stay the same. I agreed with more fruit, although the wine was still light, as well as identifying more tannins and some alcohol in the finish. The cheese seemed more funky with the wine but then savory again. After all our agreeing about the flavors of wine and cheese we had differing opinions about whether this was a good pairing. I thought the 2 were better individually and Neil said it was a good pairing but he preferred the wine by itself.